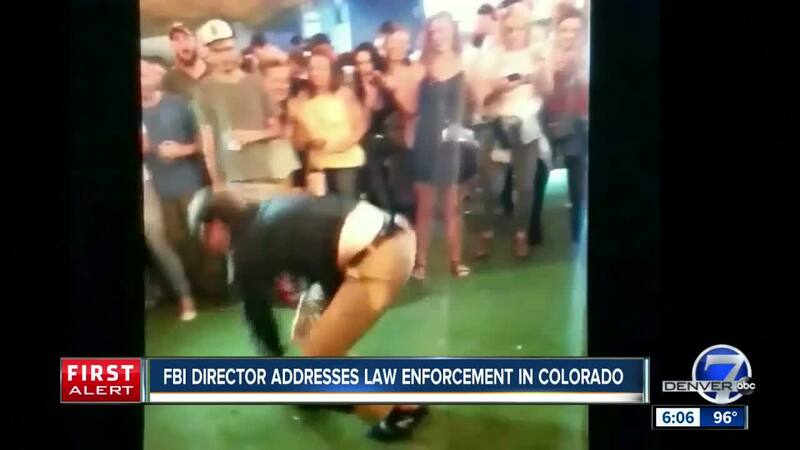 DENVER – FBI Director Christopher Wray said he was well aware of the case of a visiting FBI agent in Colorado videotaped doing a flip as his gun fell out of his pants. Wray spoke to law enforcement from Colorado and Wyoming Thursday afternoon and then took questions from the media. He was first asked about news of a second meeting that may occur between President Donald Trump and Russian President Vladimir Putin. He said he would withhold commenting until he had more facts. Wray said he was told about the development when a staff member gave him a heads up just before his meeting with law enforcement. Members of the media were invited to attend the event and asked Wray about FBI agent Chase Bishop, who was videotaped in June doing a back flip at a Denver bar as his gun fell out of his pants. When Bishop picked it up, the video shows the gun firing. Another man was hit but not permanently injured . Bishop has been charged with second-degree assault, a fourth-degree felony. Wray said the issue is still part of a personnel matter and said he would not comment on the case. “Good judgment is paramount,” Wray stressed. At the meeting with law enforcement he also praised state and local police for working together with the FBI to face challenges. “The threats that we face as a county and community have become so significant, so vexing, so persistent that even if we wanted to take them on individually, we couldn't,” he said. Wray also mentioned the need to battle cyber-attacks as one of the issues near the top of the FBI’s list of priorities.